Margaret Rose Vendryes’s African Diva Project arrives in Boston's celebrated Childs Gallery. 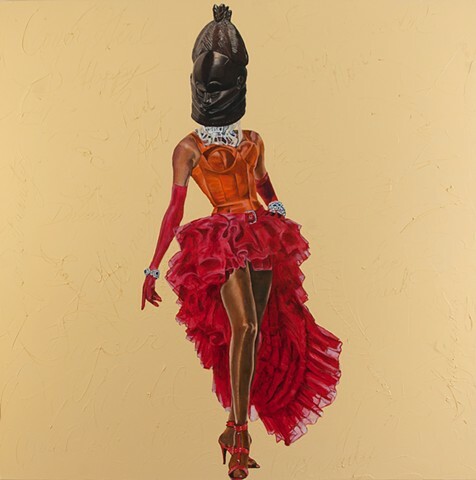 The Project's paintings explores the role of gender in African cultures and in contemporary society. Each square canvas is modeled after an LP cover featuring a Black female music legend wearing an African tribal mask. While these masks are traditionally danced by men, Vendryes uses them to empower the divas, giving them agency and protection by replacing their psychological masks with literal ones. Margaret is an artist, lecturer, historian, author and curator with a bachelor's degree in Fine Art and master's and doctorate degrees in Art History. She began The African Diva Project in 2005 and has expanded the project into an outstanding exhibition that questions the role of race and gender identification in contemporary African and African American communities.